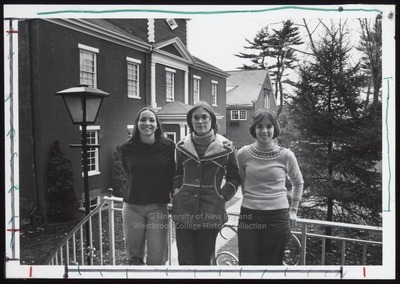 "Mary Elizabeth Gilbert, Robin Joy Francis, Katherine Lesley French, We"
Westbrook College students Mary Elizabeth Gilbert, Robin Joy Francis and Katherine Lesley French, Class of 1978, pose together at the Proctor Hall balcony railing for their senior class candid photo, which appeared in the 1978 Tower Yearbook. Mary Elizabeth was a Dental Hygiene major and a Day Hop; Robin Joy was a Medical Assistant major and lived in McDougall Hall; and Katherine Lesley was a Nursing major and lived in McDougall. The three wore jeans. Mary Elizabeth and Robin Joy wore light-weight jackets, and Katherine Lesley wore a crew neck, Fair Isle sweater with turtle neck jersey. Behind them are partial views of Alumni Hall and MacArthur Gymnasium.